The 2011 Olympic National Park Quarter 100-Coin Bag will contain 100 circulation quality strikes of the eighth coin to appear as part of the America the Beautiful Quarters™ Program. The included coins will all feature a reverse design emblematic of Olympic National Park which is located in the state of Washington. The park area itself was first afforded federal protection in 1909 when President Theodore Roosevelt set it aside as a national monument in 1909. President Franklin D. Roosevelt changed its status to a National Park in 1938. Buyers will have the choice of which Mint facility the 100 coins included in the bag were struck at – the US Mint’s facility in Philadelphia or the US Mint’s facility in Denver. The Olympic National Park Quarter will be featured in several products from the US Mint aside from these 100-coin bags including two-roll sets, proof sets, mint uncirculated sets, etc. 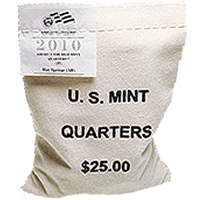 The Mint typically packages the 100-coins in a small bag imprinted with "U.S. MINT QUARTERS $25.00". Sewn into the closing stitches of the bag is a label indicating the specific strike of Olympic National Park Quarters. The US Mint lists June 13, 2011 as the release date for this product. Similar products were sold earlier in the year for $49.95. All of the America the Beautiful Quarters will feature an obverse (heads side) containing a portrait of George Washington, the first President of the United States. It is based on the original 1932 John Flanagan portrait of Washington. Susan Gamble designed the reverse to show a Roosevelt Elk standing in the Hoh River with Mount Olympus off in the distance. It was sculpted by Michael Gaudioso.